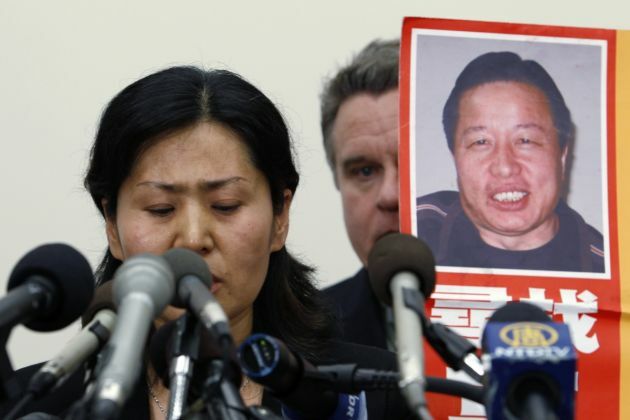 (Photo: REUTERS / Hyungwon Kang)Geng He, the wife of Gao Zhisheng, political prisoner and China's leading human rights lawyer, speaks as U.S. Representative Chris Smith (R-NJ) holds up a portrait of Gao during a news conference on Capitol Hill in Washington, January 18, 2011. U.S. Representatives Chris Smith (R-NJ) and Frank Wolf (R-VA) hosted the news conference to draw attention to human rights violation in China on the occasion of Chinese President Hu Jintao's State visit with President Barack Obama. Jailed Chinese defense lawyer Gao Zhisheng is due to complete his 8-year sentence on August 7, but his family members are unsure if he will be released on that date and authorities are pressuring them. On July 3, Geng He, Gao's wife told China Aid News, a human rights group, that her husband's relatives in Shaanxi province phoned Xinjiang Shaya Prison in a remote part of western China and received some updates on the jailed lawyer. "The person answering the call said, 'No need to come to visit him. He will be released on Aug. 7 after finishing his time in prison.'" His brother said, "But we still need to pick him up from prison. The person said, 'The prison will need to communicate with Beijing about the specifics of his release. You just wait for further notice at home.' That's all we've heard so far." The Christian lawyer was seized by the police in August 2006 and in December he was convicted of "inciting subversion of State power" and sentenced to three years in prison with five years' probation. Geng He Currently lives in the United States and revealed that Gao's family is presently under pressure. The Gao's brother said his family had difficulty dealing with the matter as they are peasants and extremely vulnerable to pressure. "We don't want our life ruined. Runhui (Gao's birth name) is such a strong man, but he still got thrown in jail and persecuted," Geng quoted him as saying. Geng He feels that the relatives have been pressured after she posted Gao Zhisheng's pending release on Twitter. "If this goes on and family members receive more and more pressure and are not allowed to pick him up upon his release, I hope international society will do something about it," Geng He said. The international community has expressed support for the campaign to free Gao. About 151,000 people have signed a petition for his release on freegao.com. In addition Amnesty International, the Tom Lantos Human Rights Commission, and the U.S. Commission on International Religious Freedom all support "adoption" of prisoners of conscience around the world, including Gao, through the Defending Freedom Project. U.S. congressman Frank Wolf, a Virginia Republican, has also been outspoken in his support for Gao's freedom.